Good news from the family of Jules Bianchi today: the Marussia Formula One racer has started a rehabilitation program for injuries sustained in a horrific wreck at the Japanese Grand Prix. While he remains unconscious, we are all hopeful that this means he will recover soon. Bianchi has been recovering from a severe diffuse axonal head injury that he sustained when his car hit a recovery tractor at Suzuka. In today's statement, parents Philippe and Christine Bianchi explained that Jules' "neurological status remains unchanged," with Jules still able to breathe on his own, but not able to regain consciousness yet. Bianchi was transferred to the Le Centre Hospitalier Universitaire de Nice to continue recovery closer to his family and friends. "As we reach the conclusion of a difficult year for our family, we wanted to take this opportunity to provide a further update regarding Jules' medical situation, per our pledge to communicate continued information, when appropriate, to his many fans. "It was a significant and very comforting step for us to be able to bring Jules home to France last month, to continue his rehabilitation surrounded by his family and friends. This is very important for Jules and also for us. "Since that time, Jules has received the very best treatment in the Intensive Care Unit of Le Centre Hospitalier Universitaire de Nice (CHU) and now at the CHU's rehabilitation centre for this kind of trauma. 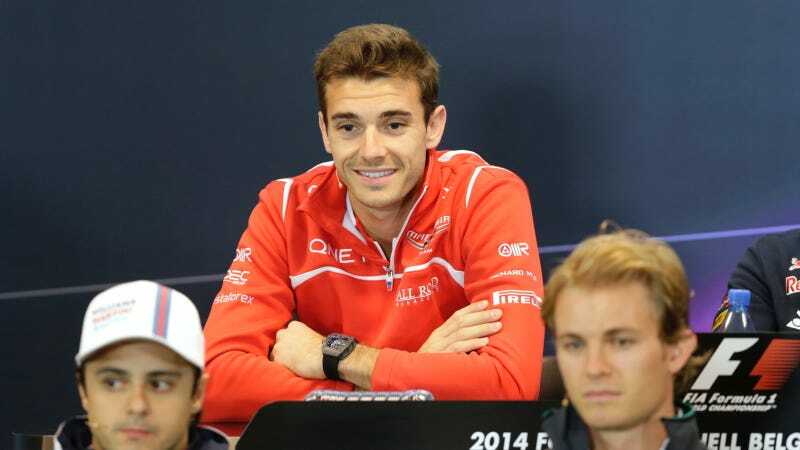 "Jules' neurological status remains unchanged; he is unconscious but able to breathe unaided. Whilst there is no significant information to report, we take a great deal of comfort from the fact that Jules continues to fight, as we knew he would, and this has enabled the medical professionals caring for him to commence the planned, but very painstaking, programme of rehabilitation therapy. "As we reflect on the events of the past few months, we would like to acknowledge once again the overwhelming warmth and affection shown towards our son. These continue to be challenging times for our family, but the knowledge that he has touched the lives of so many people all around the world has helped us through. "We would also like to acknowledge the respect and support shown by the media towards our family during this time, for which we are extremely grateful. "We will continue to provide information when it is possible to do so and our sincere appreciation to everyone who continues to pray for Jules." We hope nothing but the best for Jules and his family as he undergoes rehabilitation therapy.